If we are ever to begin to design our own art, we need an understanding of the various elements and principles of design, and how they combine to create an overall pleasing visual effect. So far, in previous posts, we have looked at Line and Shape, and how they contribute to art forms. This week, we focus on the element of ‘SPACE’ and find how it can assist to create a better design. Space as an element of art that refers to the area around objects: either Positive Space: that is areas occupied by an object or form and, Negative Space: the area in, between, around, or within objects. Every positive shape is surrounded by negative space. – Passive negative space – this separates visual elements, and includes things like margins and the spacing between letters, words, or lines. -Active negative space – this draws the viewer’s eye to something, or help viewers focus on the objects that they should see, instead of making their eyes look all over the place. A boring, metal-grey ‘signal box’ that controls the traffic lights is just that – boring and sterile. Add a little imagination and a group of unemployed art students and a phenomenon of community art is born. What is more, tenders for this community art project are called annually, by the municipal council authority. This has evolved to become a fantastic way for struggling artists to earn extra income, or, alternatively, for the councils to engage enthusiastic volunteers in the community. 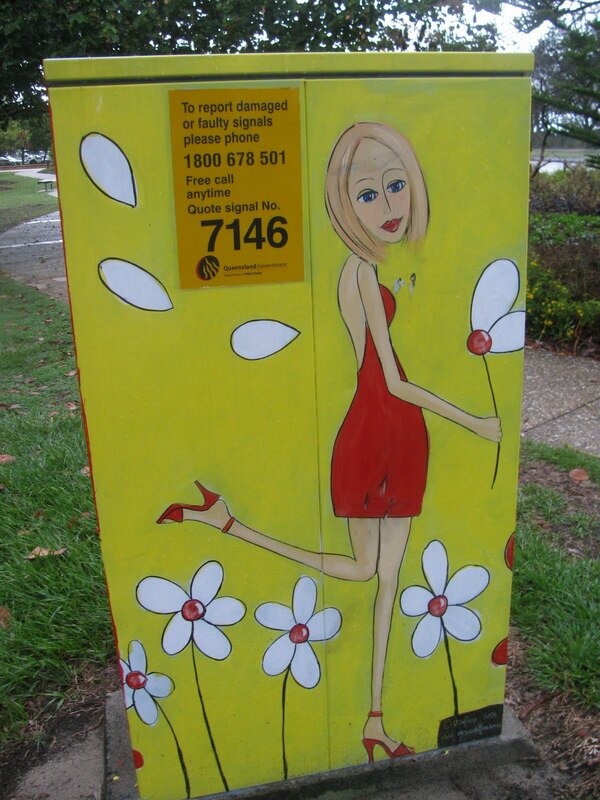 The variety of designs and local artistic ‘input’ is admirable. A brightly coloured signal box, of course, is better visually and aesthetically, than the cold, grey metal box. One could even develop a collection of photos documenting each box to form a themed picture story of one’s travels! It might be a little distracting to drivers, when waiting for the traffic lights to change at an intersection, however, it chases away the boredom and keeps one from the temptation of checking the mobile phone! 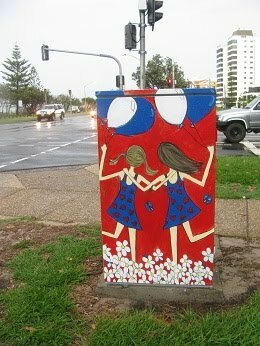 Some traffic box murals even tell a story pertinent to the street/area. Everyone loves chocolate eggs at Easter time, but for some cultures, eggs have always been much more significant than a sweet treat, and have evolved into a traditional art form in itself. This month, in Traditional Art From Around the World, I showcase some examples of Painted Easter Eggs from Eastern Europe. Poland, The Czech Republic an d other Eastern European countries, follow a tradition of decorating eggs, in specific designs and colors, at Easter. The designs themselves are painted on hen or goose eggs, not wooden eggs, as some might think, and are executed with great care using age – old techniques. The egg yolk and white are either allowed to dry up over time, or are removed by blowing through a small hole in the egg. The practice of covering an egg,with knotted wire, first developed as a Slovak tradition, but is also used in egg creations in the Czech Republic. Motifs and color combinations can at times appear cross cultural, and while traditional styles prevail, egg artists add their own individual form of inspiration in order to personalize the decorated Easter eggs. 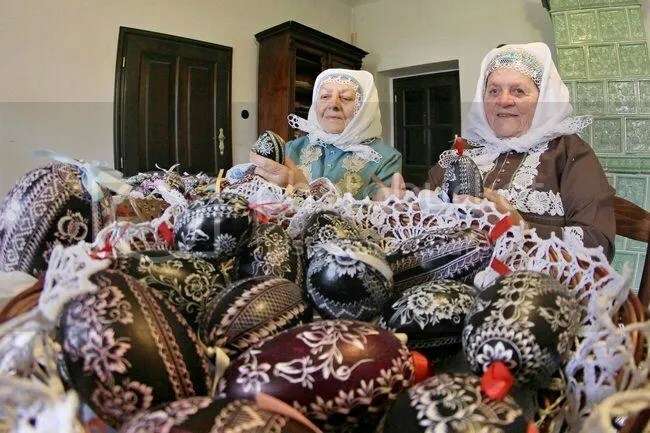 The most recognizable symbol of Easter, in Prague and the Czech Republic, is a hand-painted or decorated egg known as “Kraslice.” These eggs are made from ordinary eggs and ink, by the village girls, and are given to the village boys, on Easter Monday. On Easter Sunday, the boys make a kind of twisted cane/whip that usually decorated with a ribbon. On Easter Monday, they then travel to the houses, to visit the girls, and hit them around the legs with this whip, (an old tradition supposedly thought to increase fertility), after which the girls then give the boy an egg which the girls themselves, have decorated! These days the eggs are not so much a gift of love, from girl to boy, as a general reminder of the heritage and beauty from the region according to the differing techniques unique to each geographical, or cultural, area. In Valassko, (Wallachia, Romania), Easter eggs are decorated in red, orange, and black with figural motifs like girls and roosters, whilst South Moravia is known for eggs created using the scratching technique. Painted and decorated eggs is a traditional art form that dates back to ancient times in the Ukraine. As such, each regional area and indeed, each family developed rituals, symbols and meanings for Easter, along with their individual brand of decoration for the Easter Egg. “Pysanka” is often taken to mean any type of decorated egg, but it specifically refers to an egg created by the written-wax batik method, utilizing traditional folk motifs and designs. In the western Ukrainian town of Kolomyya, there is a museum dedicated to ‘Pysanky’, with several thousand eggs on display. The word pysanka comes from the verb pysaty, “to write”, as the designs are not painted, but ‘written’ with hot beeswax, using a stylus or a pin-head. Wooden and beaded eggs are also known as “pysanky,” because they mimic the decorative style of pysanky, but in a different medium. Several other Ukrainian techniques of decorating eggs can be identified throughout the region. All but the krashanky and lystovky are meant to be decorative, (as opposed to being edible). Krashanky –from krasyty (красити), “to decorate”– are boiled eggs dyed a single color (with vegetable dyes), and are blessed and eaten at Easter. Pysanky –from pysaty (писати), “to write”– are raw eggs created with the wax-resist method (batik). Krapanky –from krapka (крапка), “a dot”– are raw eggs decorated using the wax-resist method, but with only dots as ornamentation (no symbols or other drawings). They are traditionally created by dripping molten wax from a beeswax candle onto an egg. Dryapanky –from dryapaty (дряпати), “to scratch”– are created by scratching the surface of a dyed egg to reveal the white shell below. Malyovanky –from malyuvaty (малювати), “to paint”– are created by painting a design with a brush using oil or water color paints. It is sometimes used to refer to coloring (e.g. with a marker) on an egg. Travlenky –from travlenya (травлення), “etching” – are created by waxing eggs and then etching away the unwaxed areas. This is not a traditional Ukraine practice, but has become popularized recently. Biserky –from biser (бісер), “beads”– are created by coating an egg with beeswax, and then embedding beads into the wax to create geometric designs. Lystovky –from lystya (листя), “leaves”– are created by dyeing an egg to which small leaves have been attached. Traditions that are in danger of dying out. 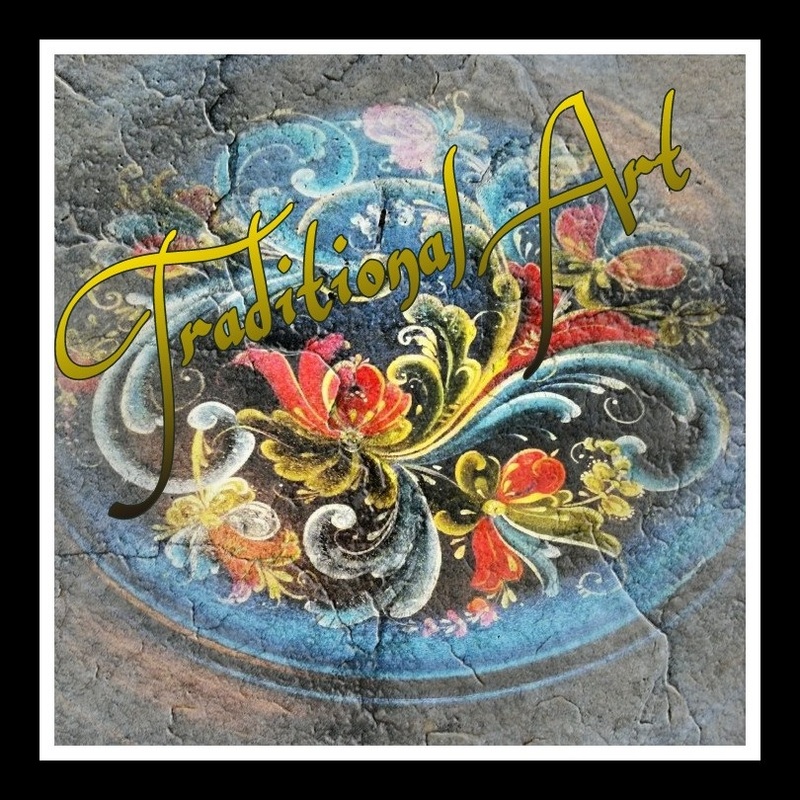 The beauty of the traditional arts is that they are by ordinary folk, untrained and unskilled. The techniques used, are taught, from family to family, father to son, mother to daughter. Their charm and naivete belies the history, long tradition and meaning in the work. The vibrant colours and cheery designs are a way for the peasants to brighten up their daily lives. Folk arts comprise sculpture, embroidery, painting,and pottery as well. It differs from region to region, and is sometimes very old. 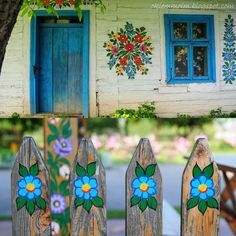 A little known area for decorative flower painting is Polish folk art in the southern or Lesser, Poland. The Zalipie style was popularised mainly by Felicja Curyłowa (1904-1974). She was a versatile folk artist. She was asked to paint e.g. interior of the famous Kraków restaurant “Wierzynek” or the dining room on the cruise ship “Batory”. The artist’s homestead became an attraction even during her life. After her death, it was bought by Cepelia (Center of Folk and Artistic Industry) and handed to the care of the District Museum in Tarnów. And Old cowshed in the Felicja Curyło’s cottage, Zalipie, has been turned into an exhibition-workshop hall where paintings by local artists are presented. Zalipie as a painted village was discovered in 1905 by Wladyslaw Hickel. He was fascinated with the local tradition of painting houses in colourful floral patterns. This custom started at the end of 19th century when old-fashioned furnaces were replaced with more modern enclosed fires and chimneys. Before that, the soot-blackened walls were only brighten with circular patches of lime mixed with wood ash but since the new furnaces with chimneys appeared, ornaments started to be more sophisticated. Women started to decorate not only interiors of their cottages but also outer walls, farm buildings, fences and even dog kennels and tree trunks. The most talented and famous painter was Felicja Curylowa whose farmstead was turned into the museum in 1978, four years after her death. But Felicja Curylowa was well known not only in Zalipie. She also painted interiors of famous restaurant Wierzynek in Krakow. She was frequent winner of local house-painting competition that have been organized annually in Zalipie since 1965. The name of this contest is Malowana Chata (Painted Cottage) and it takes place on the first weekend after the Corpus Christi Feast. This is also the best time to visit Zalipie. Zalipie village is not an open-air museum, most of the buildings are actual functioning households. Also school, post office and church were painted in colourful flower compositions. Zalipie is a unique place to visit and there aren’t many other tourists (yet). Rangoli is a traditional women’s art form common in Hindu households throughout southern India. Designs are drawn directly on the ground and entranceways as part of a ritualistic religious practice. The front steps, entrance, and walkways of buildings are properly cleaned and then decorated with designs and patterns made with chalk powders. There are a remarkable variety of styles and motifs which vary according to the tribal groups and festivals. The activity is a welcoming of deities into the home or space. In particular, the way is prepared to welcome Lakshmi, the goddess of good fortune but many gods and powers are honored. The activity of drawing the forms is a religious rite and the devotional intention is more important than the end product. The temporary nature of the designs make it clear that the significance is in the deed for it is not creating an object to be held aside and preserved. The designs are quickly lost to the passing of feet, wheels and paws, fading into the dust and bustle of daily life and the ritual of washing and drawing is rhythmically repeated, particularly on auspicious days. It is one example of the blending of religious practice and art within the rhythms of daily life that are found quite commonly throughout traditional Indian culture. Unfortunately, rapid urbanization and westernization are negatively impacting this remarkable tradition. However, even in an urban environment of modern apartment living the tradition continues on for the blending of religion, art, and everyday life is very much at the heart of Indian culture. In the early morning hours when the world is just awakening, the woman of the house begins preparations for the day ahead. Daily rhythms include a thorough sweeping and cleaning around the home as well as the courtyard and entranceways. Special care is given to prepare a particular space for drawing rangoli designs and patterns in front of entranceways and along walkways. The designs vary according to tribal groups and in terms of complexity and scale, there is a very wide range. Designs are generally done with white chalk powder but all reaches a colorful and exuberant zenith during festival time. The designs are laid out with a regular grid of dots or hatching lines which are developed into a wide host of motifs. Designs using a regular grid of dots are created by either connecting the marks or looping around them. Designs are built upon basic geometric shapes and are further developed into mandalas of swirling lines flowing, curving, and twisting into complicated knots of undulating, rotating, and repeating patterns. The grids also lend themselves to designs of fixed shapes and mosaic like tessellations of stylized flowers, plants, animals, birds, conch shells, chariots, lamps, and much more. The are also given borders and embellishments of running lines, undulating patterns, and mandala like emblems and symbols. All the designs have an underlying wholeness built upon primary geometric shapes such as circles, squares, hexagons, octagons, and a very wide range of running forms, spirals, rotations, and looping patterns. Most commonly, a simple motif or shape will be rotated and layered to build up the designs, creating a flowing movement or spiraling gesture. The result is an organic and dynamic balance between the fluidity and movement of the hand and the fixed order and determined boundaries of direct line and shape. The remarkably diverse forms reflect the expressive and devotional impulses of the women who make them. The variety of designs while traditional in origin, often have a very personal character and are a result of the creative vitality working to enliven the energies that connect earthly and cosmic forces. From a social perspective, rangoli is an outward sign that “this is a proper household where the gods are honored”. Patterns are taught to girls by their mothers and by the time they are young brides, their skills with this art form are most impressive. Quite naturally, the rhythmic nature of the activity leads to some highly developed skills in terms of draftsmanship, control of hand, and balance of form. But, all things return to the earth and the designs quickly fade into the scuff and dust of comings and goings, creating another layer to the cycles of daily life. Over the past decade, I have marveled at this Hindu practice, appreciating it’s many creative and dynamic forms as well as it’s devotional intentions. This common, everyday aspect of Indian life is a rich artistic and social tradition which imbues spaces with positive intention, heightened purpose, and deeper significance, as well as beautifying the meeting of public and private spaces. As an artist and teacher, I have been fascinated and inspired by the creativity, the endless variety, and sheer beauty of this powerful and dynamic art form.